Merger control together with Japan's first competition rules were introduced in Japan by the 1947 Japanese Antimonopoly Act (AMA). Merger control is enforced by the Japan Fair Trade Commission (JFTC), which was established as an independent administrative office with broad enforcement powers. The JFTC is composed of a chair and four commissioners and has primary jurisdiction over the enforcement of merger control under the AMA. Share acquisitions, mergers,2 joint share transfers, business or asset transfers and corporate splits (or demergers) are subject to prior notification under the AMA if they exceed certain thresholds. Mergers and acquisitions (M&A) transactions whose schemes involve more than one of these transactions (e.g., reverse triangular mergers that involve a merger between a target and a subsidiary of an acquirer and an acquisition by the acquirer of shares in the target) are separately analysed at each step of the transaction and may require separate filings for each of the various transactional steps. Domestic turnover, which is defined as the total amount of the price of goods and services supplied in Japan during the latest fiscal year,5 is used as a decisive factor in the calculation of thresholds. The same thresholds will apply to both domestic and foreign companies. According to the Merger Notification Rules,6 the domestic turnover of a company includes the sales amount accrued through direct importing into Japan regardless of whether the company has a presence in Japan. sales amount derived from the sale of goods (including services) supplied outside Japan to business entities where it is known that such goods will be shipped into Japan at the time of entering into the contract, without any changes made to their nature or characteristics. Under the AMA, different notification thresholds apply depending on the different types of transactions, namely, share acquisitions, mergers, joint share transfers, business or asset transfers and corporate splits. For share acquisitions (including joint ventures), the thresholds are based both on domestic turnover and the level of shareholding in the target. First, the aggregate domestic turnover of all corporations within the combined business group of the acquiring corporation must exceed ¥20 billion, and the aggregate domestic turnover of the target corporation and its subsidiaries must exceed ¥5 billion to meet the filing requirement.9 Second, such acquisition must result in the acquirer holding more than 20 or 50 per cent of the total voting rights of all of the shareholders of the target (i.e., an acquisition that increases a shareholding from 19 to 21 per cent is subject to a filing, while an acquisition that increases a shareholding from 21 to 49 per cent does not require one).10 A minority ownership of over 20 per cent will be caught regardless of whether the acquirer will take control of the target company. In the case of a merger, corporate split or joint share transfer, both companies intending to effect such transactions have to jointly file.15 By contrast, in the case of a share acquisition or business transfer, only the acquiring company is responsible for filing. There are no filing fees under the AMA. During FY2017, there were no significant amendments made to regulations or guidelines relating to merger control. During the 2017 fiscal year (from 1 April 2017 to 31 March 2018, hereafter FY 2017), the JFTC opened a Phase II review only in one case: the joint share transfer by the Daishi Bank, Ltd (Daishi Bank) and the Hokuetsu Bank, Ltd (Hokuetsu Bank), which was cleared by the JFTC in December 2017, without any condition. At the time of writing, The Fukuoka Financial Group and the Eighteenth Bank case, in which a Phase II review was initiated in July 2016,16 is still pending before the JFTC. The Daishi Bank and the Hokuetsu Bank are the top two regional banks based in Niigata prefecture. In April 2017, the two banks reached a basic agreement to integrate their businesses by establishing a joint holding company through a joint share transfer, aiming to address the worsening business environment. Under the merger control regime in Japan, no special rule applies to the review of mergers that involve financial institutions. The Secretary General of the JFTC recently stated in a press conference that the JFTC would apply the same Merger Guidelines18 to review the impact of mergers involving financial institutions, particularly with respect to whether the consumers' choices will be restricted as a result of the contemplated merger.19 This case is remarkable because the JFTC demonstrated how the 'restraints of trade' were assessed in a merger between regional banks in a manner that was significantly more detailed than ever before. In defining the product market, the JFTC segmented the provision of loans into two markets: loans provided to enterprises for business purposes; and loans provided to individuals for non-business purposes (typically used for the purchase of residential properties and education). This segmentation reflects the absence of demand substitutability between those two markets since the purpose and consumers of those loans are distinctive. Likewise, there is no supply substitutability between the two markets since the business know-how and resources (such as branches and personnel) required for the two types of loans are different. Furthermore, in consideration of the differences in business scale, targeted ranges and characteristics of businesses the JFTC sub-segmented the market for loans for business purposes into three sub-markets: loans for large-sized and middle-tier enterprises; loans for small and medium-sized enterprises (SMEs); and loans for local public agencies. In these sub-markets, the JFTC conducted an in-depth review of the following two areas, loans for large-sized and middle-tier enterprises, and loans for SMEs. In defining the geographic market, the JFTC conducted a survey using questionnaires to assess the geographical scope of the business activities of enterprises located in Niigata prefecture and the distance that these enterprises will search for lenders of loans.20 Consequently, the JFTC defined the geographic market for (1) loans to large-sized and middle-tier enterprises throughout the entire Niigata prefecture, and (2) loans to SMEs in each of the 10 business districts within Niigata prefecture. The JFTC noted that as a result of the notified concentration, the combined firm would have a relatively high market share: approximately 55 per cent for loans to large-sized and middle-tier enterprises in Niigata prefecture, and approximately 40–60 per cent for loans to SMEs in the 10 business districts within Niigata prefecture. The combined firm, therefore, would become the largest player in all of these markets. In addition, there would be no competitive pressure from new entrants since no bank has established a new branch in Niigata prefecture in the past five years. the survey results show that the majority of enterprises would consider borrowing loans from banks other than the combined parties and that 60 per cent of the parties' customers have actually borrowed from other banks simultaneously, it would be relatively easy for both large-sized and middle-tier enterprises and SMEs to switch their lenders if the parties raised their loan interest rate. Similarly, the JFTC found that the likelihood of coordinated conduct among the combined parties and competitors in each of the relevant markets would be low, given the difficulty in predicting the competitive conduct owing to the differing loan conditions for each enterprise depending on the type of business and financial situation. The JFTC, thus, concluded that the notified concentration would not substantially restrain competition in each of the relevant markets neither by unilateral conduct nor cooperative conduct. According to the JFTC, the total number of merger notifications filed in FY 2017 was 306. In terms of time frames, the standard 30-day waiting period will apply, which may be shortened in certain cases (see Section III.ii, below). If the JFTC intends to order necessary measures regarding the notified transaction, it will do so within the 30-day (or shortened) waiting period (which is extremely rare) or, if a Phase II review is opened, within the longer period of either 120 calendar days from the date of receipt of the initial notification or 90 calendar days from the date of the JFTC's receipt of all of the additionally requested information. It should be noted that the JFTC does not have the power to 'stop the clock' in either the Phase I or Phase II review periods. It is, however, possible for the notifying party to 'pull and re-file' the notification during the Phase I period, thereby effectively restarting the clock. There is no provision in the law and there are no regulations regarding the ability to accelerate the review process. However, in practice, it may be possible to put pressure on the JFTC by submitting a written request to the JFTC in cases where a filing is made less than 30 calendar days before the planned closing date. The Merger Guidelines state that the JFTC may shorten the waiting period when it is evident that the notified merger may not substantially restrain competition in any relevant market (which means when the JFTC closes its review prior to the expiration of the 30-calendar-day review period). Generally speaking, no third party has access to the merger notification files. Further, the JFTC does not even disclose the fact of the filing of a merger notification or clearance thereof, except for cases in which a Phase II review is commenced (in which case the JFTC discloses the identity of the companies involved in the notified transactions).21 This means that third parties cannot even confirm whether a merger has actually been notified, unless the case has moved on to Phase II. Apart from the above limited disclosure, although not timely, the JFTC usually discloses details of some major merger notification cases as part of its annual review. Such disclosure is generally subject to obtaining approval for publication from the notifying parties. Interventions by interested parties in JFTC proceedings have not historically been common. Nevertheless, there was one case in which Japanese steel manufacturers intervened in relation to the proposed hostile takeover attempt by BHP Billiton of Rio Tinto, first announced in 2007. Although third parties may file a lawsuit to ask the court to order the JFTC to issue a cease-and-desist order, the legal path to successfully do so is extremely narrow and does not merit a detailed explanation here. There are two ways for third parties to submit complaints to the JFTC in the course of a merger review: one way is to notify the investigation bureau of the JFTC of a possible breach of the AMA;22 and the other is to submit complaints to the mergers and acquisitions division of the JFTC. In addition, as stated in the Policies for Merger Review, in the event that a merger review moves on to Phase II, the JFTC will publicly invite opinions and comments from third parties. Public hearings can be held23 if deemed necessary, but they have been extremely rare to date. The JFTC sometimes conducts informal hearings, and market tests by way of questionnaires, with third parties, including competitors, distributors and customers, in the course of its review, as it did in the review of the Daishi Bank and Hokuetsu Bank case (see Section II, above). When the JFTC issues a cease-and-desist order, the parties to the transaction can appeal to the Tokyo District Court (instead of resorting to the JFTC administrative hearing procedure, as was the case in the past) for annulment of the JFTC order. The JFTC frequently holds consultations with sector-specific regulators concerning general issues as to the relationship between the JFTC's competition policy and sector-specific public and industrial policies. In this regard, it is generally understood that the JFTC considers relevant public and industrial policy issues when ruling on a given transaction, without prejudice to the independence of its competition policy review and merger review. Among the various government ministries, the Ministry of Economy, Trade and Industry has been active in advocating competition policy, but depending on the specifics of each case, other ministries may also be involved. The Merger Guidelines set out the various factors that may be taken into account by the JFTC when assessing the impact of notified transactions on the competitive situation. Specifically, the Merger Guidelines provide an analysis of the substantive test for each type of transaction (e.g., horizontal, vertical and conglomerate M&A transactions). One of the important parts of the substantive test analysis is the use of 'safe harbours' measured by the Herfindahl-Herschman Index (HHI) for each of the above three categories (see Section III.vii, below). It is also suggested in the Merger Guidelines that, both before and after the transaction, the JFTC will closely analyse market conditions from various viewpoints, including whether the transaction may facilitate concentration between market players, to ultimately determine the notified transaction's actual impact on competition. The detailed method to define the 'particular field of trade' (i.e., relevant market) is also provided in the Merger Guidelines. Importantly, the Merger Guidelines were amended in 2007 to clarify that the geographic market may be wider than the geographical boundaries of Japan, depending upon the international nature of the relevant business. Following the 2007 amendment, there have been several JFTC cases where the JFTC defined the relevant geographical market to extend beyond Japan. the merging parties' market share after the notified transaction is not more than 25 per cent and the HHI after the notified transaction is not more than 2,500. In addition to the safe harbour above, the JFTC is highly unlikely to conclude that transactions falling within the following threshold would substantially restrain competition in any particular market: the HHI after the notified transaction is not more than 2,500, and the merging parties' market share is not more than 35 per cent. If the notified transaction does not satisfy the requirements for any of the above, the JFTC will likely conduct a more in-depth analysis of the unilateral and coordinated effects of the notified transactions. In the Canon and Toshiba Medical case in 2016, the JFTC approved Canon's acquisition of shares in Toshiba Medical, Toshiba Corporation's (Toshiba) medical equipment unit. However, the JFTC also issued a statement warning that the structure of the deal could be deemed to circumvent the law, including the prior notification obligation under the AMA because the parties had provided that Toshiba could receive the payment of the transaction price of ¥665.5 billion prior to the JFTC's clearance. Specifically, Canon acquired an equity warrant for which common shares in Toshiba Medical were the underlying securities. In return for that equity warrant, Canon paid to Toshiba an amount virtually equivalent to the consideration for common shares. Further, shares with voting rights in Toshiba Medical were acquired and held by an independent third-party owner up until the time Canon exercised the equity warrant. The JFTC found that the transaction structure formed part of a scheme that was aimed at Canon ultimately acquiring shares in Toshiba Medical. The JFTC held that since there is no public precedent of its position as to such a transaction structure, it would not impose any sanctions in this case, but warned that similar transaction schemes will be considered to be in violation of the AMA in the future. In principle, the JFTC is entitled to exchange information with competition authorities of other jurisdictions based on the conditions set out in the AMA.26 In addition, the Japanese government has entered into bilateral agreements concerning cooperation on competition law with the United States, the European Union and Canada, and multinational economic partnership agreements with competition-related provisions with 13 other countries. Furthermore, the JFTC has entered into inter-agency bilateral cooperation memoranda with various competition authorities.27 It also has propounded the establishment of an international cooperative framework for merger review at the 11th ICN Annual Conference held in April 2012, which was approved at that Conference. Under these agreements and frameworks, there have been various levels of information exchange and discussions carried out between the participating authorities. The JFTC has a good track record of closely working with other competition authorities. It is reported that the JFTC exchanged information with various authorities, including its counterparts in the United States and the European Union, for example, in the recent review of the Zimmer and Biomet case in 2015 and the Lam Research and KLA-Tencor case in 2016. As explained in Section IV.ii, below, because the JFTC abolished the voluntary consultation procedure (prior consultation procedure) as of 1 July 2011, the substantive review of a proposed transaction only begins at the formal notification stage. In addition, as explained in Section III.i, above, each of the Phase I and Phase II review periods cannot be extended even in cases where parties submit a remedy proposal to the JFTC; nor can the JFTC stop the clock. This might cause difficulties, especially in global merger notifications where the management of the filing schedule is important to avoid conflicting remedies or prohibition decisions at the end of the merger review procedure in various jurisdictions. Thus, coordination among Japanese and foreign attorneys is of even greater importance following the abolition of the prior consultation procedure. Upon the abolition of the prior consultation procedure in July 2011, the JFTC no longer provides its formal opinion at the pre-notification stage, and the review officially starts at the formal notification stage. In practice, the JFTC is flexible about having informal discussions with potential notifying parties upon request or voluntary submission of relevant materials prior to formal filings. Interestingly, in almost all cases that the JFTC cleared recently after Phase II review, including the Daishi Bank and Hokuetsu Bank case, the JFTC made specific notes in its announcements that the parties had submitted supporting documents and opinions to the JFTC on a voluntary basis prior to officially filing the notifications. It is understood that parties to complicated mergers make use of that informal procedure to try and alleviate any potential concerns early. The JFTC seems to be receptive to such informal prior communications. The Merger Guidelines recognise the 'failing company doctrine'. They state that the effect of a horizontal merger would not be substantial if a party to the merger has recorded continuous and significant ordinary losses, has excess debt or is unable to obtain financing for working capital, and it is obvious that the party would be highly likely to go bankrupt and exit the market in the near future without the merger, and so it is difficult to find any business operator that could rescue the party with a merger that would have less impact on competition than the business operator that is the other party to the merger. It should be noted that minority ownership of over 20 per cent of the voting rights in a company is a notifiable event regardless of whether the acquirer will take control of the target company (see Section I.i, above). In addition, in the JFTC's substantive review, any companies that are in a 'close relationship' with an acquirer or a target may be deemed to be in a 'joint relationship'. Accordingly, these companies could be treated as an integrated group for the purpose of the substantive analysis. For example, the HHI would also be calculated based on the sales data of the integrated group as a whole. In the Idemitsu and Showa Shell case in 2016, the JFTC made clear that its review assumed that these parties would be completely integrated as one group after the acquisition, although Idemitsu only intended to have a minority shareholding in Showa Shell after the acquisition. The joint relationship will be determined by taking into account various factors even though, according to the Merger Guidelines, a minority holding of voting rights of over 20 per cent and the absence of holders of voting rights with the same or higher holding ratios of voting rights would suffice to find such relationship. Seven years have passed since the amendments to the Merger Review Rules and the Policies for Merger Review were introduced in June 2011. These amendments primarily concern the procedural aspects of merger reviews by the JFTC, while some clarifications were also made to the substance of the JFTC's review policies. Since these amendments, the scope of disclosure, which the JFTC has made in relation to its review of Phase II cases and as part of its annual review about recent major cases, seems to have expanded. For example, in the JXHD and TG case and the Idemitsu and Showa Shell case in 2016, the JFTC disclosed specific details of the economic analysis it conducted, thereby giving greater transparency to its review. Although these disclosures have been generally welcomed by practitioners, when compared to the practice of other leading competition authorities, there is still a relative lack of available information as to the JFTC's decisional practice (e.g., few decisions are published), and there are some areas where further clarification or improvements seem necessary (e.g., as to market definition). It is hoped that the JFTC will take action, for example, through the publication of more decisions and of new or updated guidelines in the near future. 1 Yusuke Nakano and Takeshi Suzuki are partners, and Kiyoko Yagami is a senior associate at Anderson Mōri & Tomotsune. 2 The JFTC uses the term 'merger' in its English translation of the AMA to describe what is called an 'amalgamation' in many other jurisdictions. 3 Article 10, Paragraph 5 of the AMA. 4 A combined business group consists of all of the subsidiaries of the ultimate parent company. A company will generally be considered to be part of a combined business group not only when more than 50 per cent of the voting rights of a company are held by another company, but also, if its financial and business policies are 'controlled' by another company. The Merger Notification Rules specify detailed thresholds for 'control' to exist, which might be found even in cases where the ratio of beneficially owned voting rights is even slightly higher than, 40 per cent. The concept of 'control' to decide which companies are to be included in the combined business group is in line with the concept of 'control' used to define group companies under the Ordinance for the Enforcement of Companies Act. 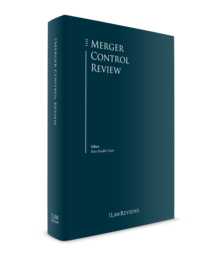 This concept of 'control' generally (there are still some differences) aligns Japanese merger control with the merger rules of other jurisdictions, especially the EU rules as to the identification of the undertaking concerned. 5 Article 10, Paragraph 2 of the AMA. 6 The Rules on Applications for Approval, Reporting, Notification, etc., pursuant to Articles 9 to 16 of the AMA (as amended in 2015). 7 Article 2, Paragraph 1 of the Merger Notification Rules. 8 Article 2, Paragraph 2 of the Merger Notification Rules. 9 Article 10, Paragraph 2 of the AMA. 10 Article 16, Paragraph 3 of the Implementation Rules of the AMA. 11 Under Japanese law, 'joint share transfer' refers to a specific structure stipulated by the Companies Act of Japan that involves two or more companies transferring their shares into a new holding company in exchange for shares of that holding company. 12 Article 15, Paragraph 2 and Article 15-3, Paragraph 2 of the AMA. 13 Article 16, Paragraph 2 of the AMA. 14 Article 15-2, Paragraphs 2 and 3 of the AMA. 15 Article 5, Paragraph 2; Article 5-2, Paragraph 3; and Article 5-3, Paragraph 2 of the Merger Notification Rules. 16 JFTC press release of 8 July 2016, whose abbreviated version is available in English at www.jftc.go.jp/en/pressreleases/yearly-2016/July/160708.files/160708.pdf. 17 JFTC press release of 15 December 2017, whose abbreviated version is available in English at www.jftc.go.jp/en/pressreleases/yearly-2017/December/171215.files/171215.pdf. 18 The Guidelines to Application of the Antimonopoly Act Concerning Review of Business Combination (31 May 2004 (as amended)). 19 JFTC press conference on 6 December 2017. A summary (Japanese only) of that press conference is available at www.jftc.go.jp/houdou/teirei/h29/oct_dec/kaikenkiroku171206.html. According to the Secretary General, there have been 14 merger notifications for the integration of regional banks in the past 10 years. 20 It is reported that the JFTC sent the questionnaires to over 7,000 enterprises located in Niigata prefecture and received responses from half of these respondents. 21 Policies Concerning Procedures of Review of Business Combination (14 June 2011; Policies for Merger Review, as amended in 2015). 22 Article 45, Paragraph 1 of the AMA. 23 Article 42 of the AMA. 24 Article 9 of the Rules on the Procedures of Hearing of Opinions. 25 Part IV, 1(3) and Part V, 1(3) of the Merger Guidelines. In practice, if a transaction satisfies the safe harbour conditions in (a) and (b), the JFTC does not conduct any further substantive review of the transaction. 26 Article 43-2 of the AMA. 27 A list of all international agreements and memoranda concerning competition law is available at: http://www.jftc.go.jp/en/int_relations/agreements.html. 28 At the time, qualifying share acquisitions were subject to ex post facto reporting requirements.